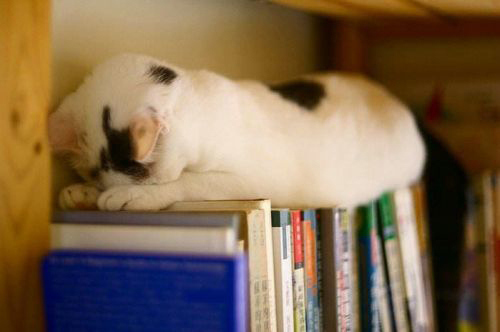 Comfort is the only thing that counts when kitty goes to buy books. Being involved in the occult book writing business, I run across all types of interesting comments about the nature of the occult book publishing world. Every once in awhile, I have to say something because if I don't, my head will explode. And my cats really do not want my head to explode...it might interefere with the petting, the litter box cleaning, and the opening of cat food cans. Why do occult writers publish secret information? Because the publishers tell us to. A few years ago, a publisher saw a sample of something that I was working on. They expressed interest in the project, clear up to the second that they discovered that I was the actual creator of the material. If the material would have been written by some old dead Adept, then they would have gladly published it. But because it was a modern creation, they didn't think anyone would buy it. Hence, if you want to be published by an actual publisher, you have to publish secret material. Let's pretend that you refuse to do so and decide to self-publish your own stuff. Then you get called a fraud, a New Ager, and a whole bunch of other names. Often by the very people that do not want you to publish their secret information. And it is very likely that these same people have actually helped leak secret information from a rival group in order to undermine it. So they do not want you to publish their secrets, think it is ok to publish other people's secrets, and do not want readers to think that anyone other than themselves know anything. And because you are thinking for yourself, and sharing your own research and experience, they want to make sure that no one listens to you...because I guess that they want to have the entire occult market to themselves. The interesting part is that labeling independent writers not publishing secrets, frauds and New Agers, you encourage them to go looking for secrets to publish. Or to lie about the sources of their material. Furthermore, you encourage readers to ignore them, and publishers to continue to insist that only secrets sell occult books. It is a nice little ugly cycle, isn't it? All self-published occult books are crap that could not be published by a real publisher. Wrong. Some self-published occult books are the result of writers not wanting to deal with the evils of a traditional publisher. Another reason is that self-published writers can focus on a smaller niche. For instance, while pitching another project, a publisher (not the one from the previous example) told me that my target audience was only a hundred people...because it involved being a high Grade initiate. In other words, I had a choice---write something New Agey or quit writing about the occult. Thanks to the print-on-demand and ebook markets, I no longer have to do that. Also see below about the importance of a publisher. Occult writers only write for fame and fans. No. In fact, occult writers would be better off writing romances if they wanted fame and fans. Occult writers only write for money. No. You are thinking of people who write erotica and ads for Russian bride websites. A publisher is necessary for a good book. A few years ago, a book came out. It was under a publisher's imprint. It was a new publisher. At the time, I was still attempting to get my occult stuff published by a "real" publisher. So I did some checking...only to discover that the publisher did not actually exist beyond the title and copyright pages of this particular book. This book has gone on to be the official word on its subject and sells for an outrageous price on the resale market, yet it is actually self-published. The truth of the matter is that anyone can buy a "vanity ISBN" and claim to be a publisher. Furthermore, the publishing houses have a horrible track record for predicting the future success of books. They also fall flat on their faces when it comes to editing, growing talent, and marketing. A self-published writer can farm out everything that a traditional publisher is claiming to do (and for your first book, they do next to none of it---basically, your book has to be publishable without no work on their part in order to get though the publishing house system). A self-published writer can hire editors, ad-people, and cover artists. And once they slap a vanity ISBN on, you will not be able to tell the difference. Unless, you are in the business. Ebooks are going to kill off paper books. And we must keep killing those trees---damn them and their oxygen producing. Seriously, have you ever tried to get candle wax off an ereader? As long as people continue to do rituals from strange books, you will have paper occult books. If only for safety reasons---in an emergency, it is sometimes necessary to destory an occult book. Have you ever tried to destory an ebook? You have lived a really strange life, haven't you? Yes, thanks for noticing. Now, I am off to write some erotica about a Russian bride. Either that or I am going to go feed the cats for the fourth time today. It seems some people have a misguided view of the publishing business, and some criticise things and yet don't want to see those criticisms addressed by new publishers or authors who self-publish. People tend to think that authors are rich, but they don't see the payslips involved, which are usually miniscule compared to other work that could be done. I can certainly earn more from journalism than selling books at the moment, for example. Unless you're a big name, publishers generally don't bother to advertise or market your book. The author is expected to do a lot of that for him/herself. Therefore many people who go with a small press or self-publish are not necessarily any worse off in that regard. Ebooks won't replace paper books, but they are certainly taking up an increasing amount of the market. Occultists tend to be book nerds, with large physical book libraries, so I think there will always be sales in that regard, but I've noticed that more magicians want ebooks now than ever, if only because they've no space left. That market needs to be served. 1) The purpose isn't to hurt any organization by making it's rituals known. The purpose is to give people something they can use in their own work. While many times in GD rituals they can't be picked up or even adapted to a solo work, each bit of knowledge helps with the big picture. 2) If a group stops using a ritual because it becomes known and replaces it with another ritual, what does that say about what they value? The purpose of a ritual is something that works. The purpose of a series of rituals and degrees is to carefully step someone into a hopefully more evolved state. The rituals work or they don't. If I have a set of rituals that work, I don't care that group x replaced those rituals because they became public knowledge. If I'm in group x and the rituals get replaced because they become public knowledge, I am going to feel that the group is more interested in selling something they keep secret than in doing the actual work. That would make me feel it is all about power, ego's and money. "If the material would have been written by some old dead Adept, then they would have gladly published it. But because it was a modern creation, they didn't think anyone would buy it. Hence, if you want to be published by an actual publisher, you have to publish secret material." You make some wonderful points. I think though dealing with some smaller but good presses you'd be able to get new stuff, labelled as such, out there, if it was good quality. Certainly that is my experience. Also, in my experience some smaller publishers do put a lot into a first work they believe in. I think the advent of new technology will mean a lot of new and exciting works will be coming out of the smaller presses, such as Dean and Nick's Kerubim. This is very good and I look forward to it. The smaller presses are going to be where real occult books are written. When I wrote for Llewellyn I had to write a Llewellyn book. This meant cutting out a lot of the hard stuff, it also had to remove a lot of the humour and was forbidden to say anything controversial. Writing for someone like Kerubim I can turn out books that say something and mean it. We are already seeing books coming out which might never have seen the light of day with bigger publishers who need to make a lot of money to cover their costs.